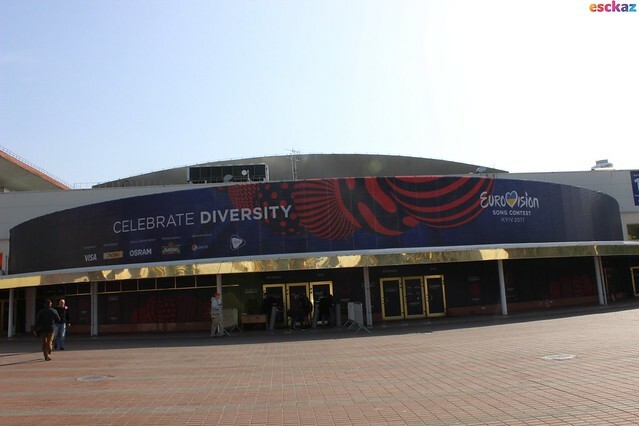 Albania | ESCKAZ.com live from Lisbon! Eugent is shrouded in blue-tinted darkness for the first verse before the first chorus springs the song into life and the lights come up. Red and yellow seems to be the choice of the day - similar colours to Iceland's lighting. Vocally, Eugent is already on top form and he mentioned previously that the focus would be on the song - that's just how it is. He stands centre-stage for most of the performance, really only moving from his spot towards the climax of the song. Very strong first rehearsal that saw some applause break out in the Press Room. Yesterday the delegation from The Netherlands held their reception at the sophisticated Premier Palace hotel in a nice atmospheric restaurant at the roof. The splendid weather and the attending delegations added all that was needed to make it a great evening. 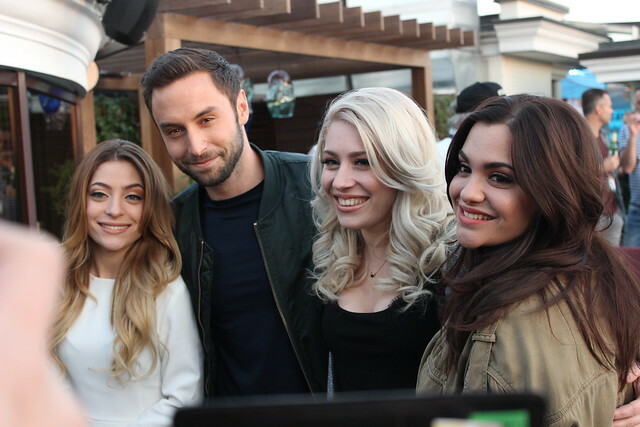 OG3NE really took their time to speak to all the press, both national and international as the sunset made the view from the rooftop even more stunning than it already was. We also met with Slavko from Montenegro, Brendan Murray from Ireland and Martina Bárta from the Czech Republic and spotted Lindita from Albania who joined Slavko to sing for the birthday of Itai Eithan Shamir. All in all a wonderful evening and we'd like to thank the Netherlands delegation for inviting us. Check all our photos here! Lindita is also wearing a cape, but a white hooded one. She holds that long note very easily. How does she do it? First of all, once again the rehearsals 3 and 4 in the running order are switched, so that we are first heading to Albania. In the semi-final itself it will still be Australia first, and that can only benefit Albania as coming after Georgia certainly won't do them any favour. Lindita is wearing what almost looks like a silvery glitter wedding dress, veil included, and the arches behind her initially add to t hat feeling. Obviously the veil goes off soon enough. Just all around under her shoulders the dress, or rather top, has some frails on it, I'm not liking that it all. Now I have to say I don't remember whether the backings were on stage during the first rehearsal, but they are now, in the back and in black. Vocally good performances from Lindita, she's still doing the high screechy notes she introduced a few days ago, but this time without awkward silences after it so it all comes across a lot better, from the hall that is at least. I also think the whole backdrop is strange, I know it's from the video but already there I find it really does not say anything about the song, the visuals would fit better to a different song and vice versa. All in all I think the main merit of this song is Lindita's vocals. I'm not to fond of any of the rest of it. Well the most important tasks for me, always, on day one is to actually get into the press centre in good time, and hunt the interview lists. So The Boss and I duly arrived at around 7.45 in the morning to make sure we were in a reasonable place in the queue to get in - first! The only real issue we had with this was that actually entering the building ended up being so confusing, with two queues (one for S accreditations and on for P) but in the end it all worked out as we were the first to get in. Which leads onto task two. Hunt the interview lists. This is a huge thing for me each and every year, there are never lists prepared in advance, the poor volunteers never know what I am talking about and it often takes about 20-30 minutes to even get them to prepare some sort of list for the press wanting to book interviews. When you bear in mind that the first rehearsal is on stage at 10, the press centre opens at 9 and there are other things to get on with, this can cause a little raising of the heart rate! Not this year though - amazingly, wonderfully and to my deepest delight - the lists were already prepared in advance….who knew that Ukraine could be so organised???? So well done on that! So all in all the day started off really well in the end….computers all worked, wifi and LAN were fantastic speeds (Thanks Swedish Tecchie guys) and not too many hordes of massed fans running around like school girls on a day out from St Trinians. All going so well so far yes??? Err well no, cos that’s when rehearsals started on the big screens…. Now we know that every year there are sound issues, always with the first run through. So if we know there are always problems, then surely the organisers should know the same? And maybe, you know, test things first? Nah, that would be too simply. So we were left with watching the big screen and attempting to listen to the sound coming from the arena next door. Which was fun. Anyway maybe I am being too harsh and expecting too much? Still it was all solved pretty quickly and left with the delight of the Swedish rehearsal. Belgium OMFG what the hell was that? Team Kaz has 2 full time and some part time English bloggers so if you want detail on who wore what, who did what to whom, and that Azerbaijan step Ladder please check them out…. Some last thoughts on today's first rehearsals. Overall there haven't been that many surprises I think. Everything started and ended perfectly on time. Obviously a lot was expected from Belgium but I also think that the earlier performances already did a bit to lower those expectations. Georgia and Albania once again delivered great vocals (even though the latter's experiments weren't such a great idea in my opinion). Vocally Australia was also really good but his face all over the screens is a bit much for me. That leaves Finland and Sweden who hardly changed anything to their performance and did a really good job, especially considering it's just a first rehearsal. Montenegro was the most extravagant act of the day and I would've been surprised with anything else. It also really stand out with its draw. Last but not least Portugal, I find it hard to say something about it as another singer can leave a completely different impression. I think it will be mesmerising on the night, especially if flags don't ruin the view as they kinda did with the Dutch performance of 2013 (Anouk - Birds). So on to tomorrow where we will see the last songs from the first semi. I think there's a lot to look forward to. A few of them have been around quite a lot with promo-tour performances but for others like Greece and Armenia it will be really interesting to see the staging as they either were hardly performed live or didn't really show a lot in the previous performances. I'm also quite looking forward to Iceland. Before the national final it was quite the favourite already, then many people were disappointed but with a different staging that might all change again. And then there's Moldova, obviously not the masterpiece of the year but one of the songs that always gets me in a good mood, so I can't wait! All in all another exciting waiting for us, see you tomorrow!